The children arrive at this breakout classroom before or after school for recreational activities in the context of anniversaries, project weeks, crafts, culture, etc. These children often have siblings in community centres or homes, or their mothers are working in programmes organised by the SOS Social Centre. My name is Osman José, I am ten years old and will turn eleven on 10 June this year. I'm studying at the SOS Hermann Gmeiner School Estelí in an evening classroom of fourth grade; every morning I go to the breakout class, together with one of my brothers. I have two younger brothers; one is called Gabriel Adrián, and the other one is Oswaldo Antonio. 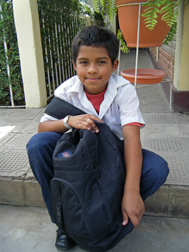 Gabriel is six and is in first grade; Oswaldo has just turned two is in one of the classes for smaller children. I live in a small house made of wood. There are two families living in the same house and my family has only one room. I share a bed with Gabriel Adrián. I would like my house not to be made out of wood, and that there was more space for my family. But I like it because I live with my mom and my brothers. My dad is a mechanic and he doesn't live with us. I visit him on weekends, I go there to play with my cousins and to talk to him. When I grow up, I want to do the same work as my dad does. At my school, I get along well with my classmates and what I like the most is that my teacher cares for me and that my classmates respect me. My favourite subjects are: Science, Maths and Spanish, the others I don't like that much; for example, I don't understand much English yet, and Social Studies does not speak about nature. I love everything related to plants and animals. I've been attending breakout classes for three years now at the social centre. I have friends here who are in other grades; they respect me and we play and do homework together; I also talk to the teacher. Last year, when the school year came to a close, I asked social centre director Jazmina not to change our teacher Yadira, who helps us with the breakout class, because she cares a lot about us, and thanks to her we are good at school. I would like the breakout room to be larger, so more children could come. Being in this class has helped me a lot in other classes, because I review some topics, I make crafts with teacher Yadira; she helps to do things for the small children, and my mom is happy because Gabriel and I don't stay alone at home anymore. When I was on vacation I did a lot of chores in the house, one of them was taking care of my uncle's roosters on weekends. I liked taking care of the roosters, although sometimes they pecked me, but my uncle gave me some coins for helping him. I also helped my mom with cooking, but now she is scared because once, while cooking rice, I burned my cheek a little bit by accident. When I grow up I would like to have kids, a house of my own and a girlfriend, and work to help my mom and my brothers. The SOS Social Centre Estelí Este provided support to 362 families in 2008. This year, it reached 100% coverage of the projected target and an attendance of 99%, which means 207 children at the SOS Social Centre and 292 children at community centres and homes. During 2008, SOS Children's Villages Nicaragua helped 4,637 children through its family strengthening programmes throughout the country at ten social centres, 32 community centres and 28 community homes.